DOWNLOAD THE BOOK ON THE HOME PAGE TO LEARN MORE! WE SAY: “America should look at immigration as a way of rewarding its citizens with jobs”. America should do all it can to entice immigrants to our country who can start a business and create jobs. Immigrants who wish to be placed on the fast track to citizenship should show that they have created and operated a profitable business within the USA for 5 years that had at least 25 American employees with college degrees or at least 50 American employees with or without college degrees. 1,000,000 new immigrant citizens who create 25 million high paying jobs in America is a far better policy than 1,000,000 illegal immigrants who take 1 million jobs from our poorest citizens. Do not have any jobs skills. Do not speak the language spoken by the majority of citizens in the USA. Are just trying to better themselves. Isn't that what everybody (especially the unemployed) is trying to do? WHAT IF THERE WERE 11 MILLION FAILURES TO SECURE THE KOREAN BORDER? If there were 11 million failures to secure the Korean border, they would be at war right now. It would be unfathomable for a North Korean to think about driving over their border fence in an SUV. So does it make sense to have 30,000 of our troops over there to tightly secure their border when our own border is so porous? In addition to removing the 109,000 troops from Afghanistan, we advocate the removal of nearly 50% (80,000 troops) of the remaining troops stationed around the world and placed along our southern border until it is secured. Removing American troops from the Korean peninsula would eliminate North Korean’s greatest political hot button, to which they refer to as American imperialism. What good is it to build a fence? As shown in the photo, a poorly guarded fence doesn’t do a whole lot of good if non-regulated people can just simply build ramps and drive over the thing. By expanding the selected six existing military bases along the border we can close off a large portion of the border with our military. 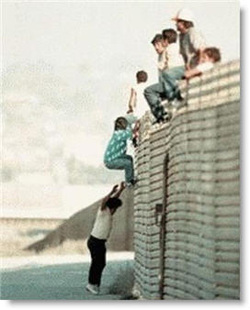 Then the border security agency could concentrate on people that cross at the established border crossings. INCREDIBLE INSULT FROM MEXICAN PRESIDENT in our capital! On 20 May 2010, Mexican President Felipe Calderon gave a speech before a joint session of the US Congress in which he criticized our nation, our Constitution, and laws passed by our states! Incredible as it would seem, Congressional members from one party and White house officials applauded the Mexican President’s criticism of US laws and insult to our nation! It is not right for the president of another country to come here and criticize (from our own capital building!) our nation or our states for wanting to stop human smuggling and drug trafficking, or secure our border. He said the United States must stop the flow of assault weapons and other arms across the border. Pres. Calderon called on Congress to reinstate the assault weapons ban. "The Second Amendment is not a subject open for diplomatic negotiation, with Mexico or any other nation," said Sen. John Cornyn, R-Texas, the ranking member on the Judiciary Committee's immigration, refugees and border security subcommittee. Cornyn also stated that it was “inappropriate" for Calderon to "lecture Americans on our own state and federal laws." Thank you Sen. Cornyn! In order to stop the flow of guns across the US-Mexican Border (and respond to the insult from the Mexican President), we advocate a major buildup of military bases along the border and a complete 100% screening of all vehicles that cross the border. The US military has performed a tremendous job of preventing border crossings along the 160 mile Korean border and the Iron Curtain borders for decades; and now they are needed to prevent the illegal transport of guns across our 1,966 mile southern border. The United States spends over 4.4% of their GDP ($865 Billion of their Gross Domestic Product) on the military while South Korean spends only 2.7% of their GDP or only $31.7 Billion. South Korea is still technically at war with its northern neighbor and they are spending much less money on the defense of their own country than we do. Spending so much less money on the military reduces the amount of tax revenue South Korea needs to generate and allows companies operating within their border to have a tax advantage over companies operating in the USA. Furthermore, we believe that an additional 100,000 troops from America’s interior bases should also be moved to the seven suggested military bases listed below to prevent any “guns” from crossing our southern border. The 180,000 troops should be re-located to the following suggested military bases (listed east to west) and provided with resources (via a momentary increase in military spending) for a rapid redeployment to any of the foreign regions from which they are withdrawn.